Cappuccino. Caramel. Chocolate. What is not to love? 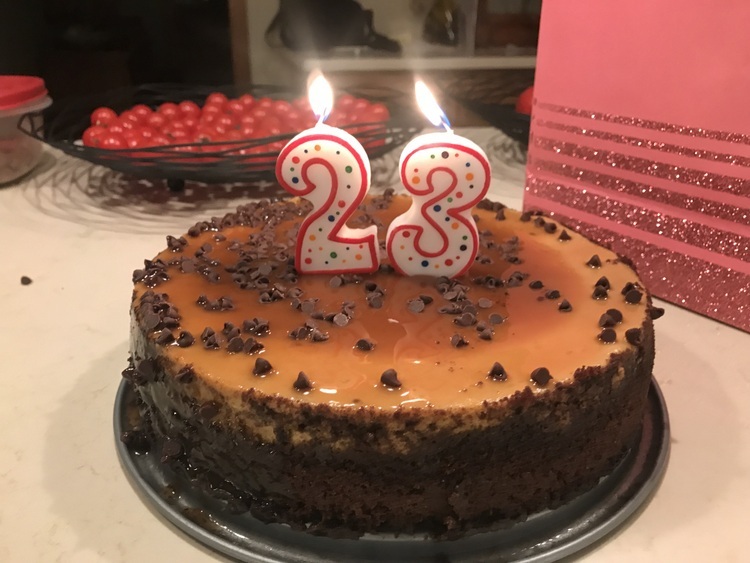 I made this cheesecake by special request for a most special someone’s 23rd birthday. This cheesecake is packed with flavor without becoming overwhelming. 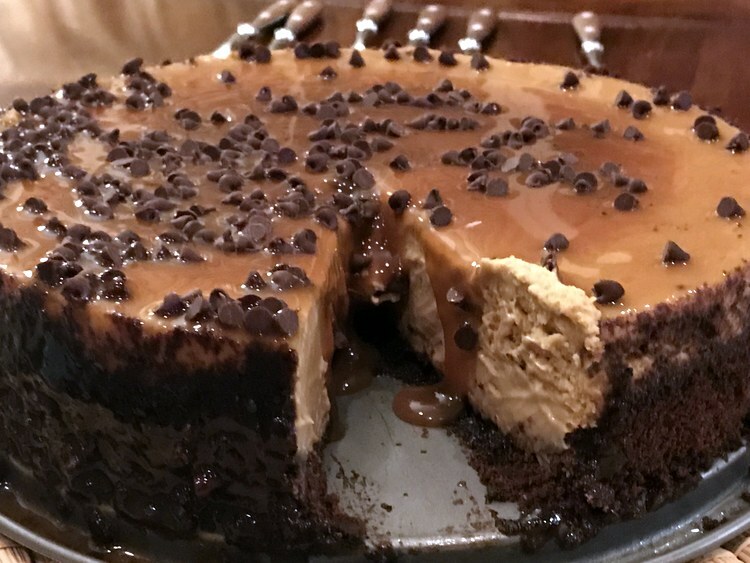 I was a bit lazy when I made the cheesecake pictured and used chocolate chips on top. It would be significantly better and prettier with shaved chocolate instead. It is better made a day in advance and given a full 24 hours to refrigerate. Preheat oven to 350°. Securely wrap a 9" springform pan in heavy duty aluminum foil. Place the first five ingredients in a food processor; cover and pulse until fine crumbs form. Gradually add melted butter, pulsing until combined. Press crumb mixture into the bottom and half way up the sides of the prepared pans. Beat cream cheese and brown sugar until smooth. Beat in sour cream, Kahlua, flour and espresso. Add eggs, beating until just blended. Pour cream cheese mixture into the crust. Place springform pan in a larger baking pan; add 1 in. of hot water to larger pan. Bake 55-65 for minutes or until center is just set and top appears matte. Remove springform pan from water bath and remove the foil overwrap. Allow the cheesecak to cool for about 15 minutes before loosening the sides with a knife and releasing the spring on the pan. 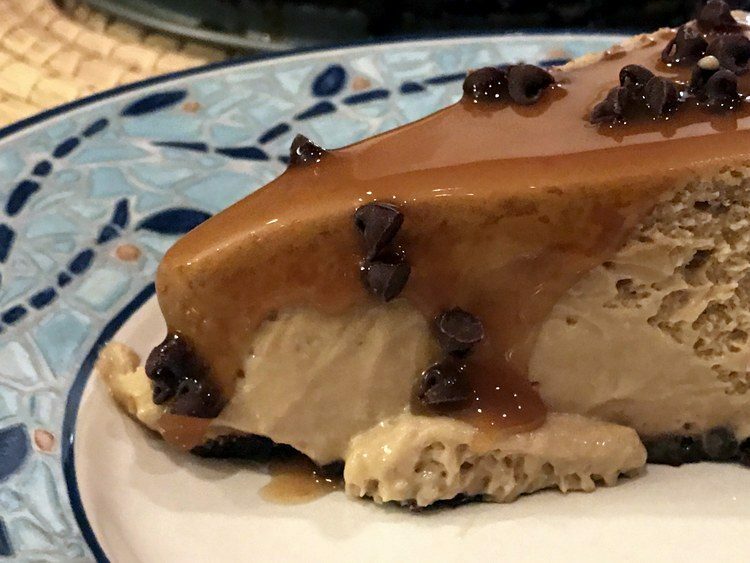 When the cheesecake is cool enough (to room temperature), pour caramel sauce onto the cheesecake , then cover and refrigerate overnight. Just before serving, remove the rim from pan. Shave chocolate onto the top of the cheesecake and sprinkle with sea salt. Yield: 12 servings.